Summer’s (almost?) here and the time is right…for brewing in the street….or at least outside. Ok, that was just awful. Warm temperatures mean BBQs and beers for thirst quenching. We have a whole bunch of recipes queued up for the upcoming days of summer. I am starting it off with a summer ale recipe. Steep Munich, Wheat, and Cara-Pils malt in 2 gallons of 150° F water for 45 minutes. Add to boil with Malt Extract and Chinook hops and boil for 60 minutes total. Add first addition of Sterling hops at 15 mins. Add lemon zest (I buy 4 big lemons and use a microplane grater to get the amount of zest I need for the recipe), ginger root (Grate this as well. Try the low range of the scale presented in the recipe first), and second addition of Sterling hops with 5 minutes to go in the boil. See comments below for more instructions. Cool wort to 70° F, pitch yeast, and ferment for two weeks, maintaining 70°F temp. 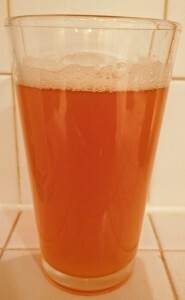 I have brewed this beer several times since I posted the summer ale recipe back in 2008. At that time, I was trying to emulate commercial summer beers that were available to us in the MA area that were basically simple ales with a few special ingredients like the ones offered from Sam Adams and Harpoon. The most important thing to keep in mind when following this recipe is to have a good fermentation. You want this beer to finish dry and to let the ginger, lemon, and hops be the main focus in the taste and the aroma. Make sure you use a yeast strain that attenuates well and pitch a mighty starter and maintain the fermentation temperature. Hope this recipe serves you well since summer time is a great time for homebrew. How much water should be added? Is this an implied 5 gallon recipe? Yes, this recipe is to be used to produce a 5 gallon batch. sorry, another question; I’m a bit new to this, but excited to try a lemon beer variety. Is the first item a dry material, or is it the syrup extract you can buy? any other details are much appreciated. This looks like a great recipe so I want to get it right. Also, is that Wheat Malt and Munich Malt GRAIN, or are you referring to the powdery dried light malt? thanks again. .. I’m almost there. The first item is a dry material. It’s malt extract that is in a powdered form. It’s the same thing as the syrup, just a different form. I like the dry stuff because I find it easier to work with. The Wheat and Munich Malts are grains. You would buy them in grain form from your homebrew ingredients shop. Hope that helps. Comment with more questions! step 1. I understand to steep the munich, wheat, and carapils grains with 2 gal for 45. I’m confused about the ‘add to boil’ comment in the second comment. Mostly, I’m struggling to understand the order of events… Should I first steep, then add with malt and chinook and start a boil, wait 15 then add stirling, etc…. Am I to add the malt and chinook to the step 1, and then get it to boil? I’m trying to understand the phrase ” boiled at”. Does that mean “boil for… long” or “throw in to existing boil at this time”? I reread the post…and yeah, I am leaving out some pretty crucial details. I think I typed this one up in a hurry and didn’t really sort out everything I needed to say. This recipe is for homebrewers who have a pot that can handle a volume of wort of over 6 gallons. Hopefully you have that. If not, it’s not a deal breaker. I can give you what I would do in both situations. I usually steep my grains in a smaller pot. I usually do my boiling in my 7 gallon pot. In my case, I would steep my grains in the smaller pot. As that was going on, I would start to boil 4 gallons of water in my 7 gal. brew pot. Probably just over 4 gallons. Once the 45 mins of steeping time was up, I would add the steep to the boiling pot and add my first ingredient additions, which are the extract and the Chinook hops, to the boil. Now if you have a small pot, here’s what I would do. First off, I would figure out how much liquid my pot can contain without having a major boil over. I think the biggest pot we have in the kitchen only can handle a 1.5 gallons. If so, steep in that volume. Once the steeping time is over, remove the grain bag and turn up the heat to boil the steeped liquid. Once it hits a rolling boil, add ingredients as instructed by the recipe and boil for 60 minutes. Once you are done with the boil, you will need to cool the wort to 70 degrees and add water to your fermenter to make five gallons of wort….probably between 3.5 and 4 gallons of water. P.S. The times noted in the recipe are for how much time is left in the boiling period. So, the Sterling hops would be added in when there is 15 minutes to go in the boil or 45 minutes from the beginning of the boiling period. thanks John. Very helpful. When you refer to the ‘grain bag’, is this a bag used in the steeping process? Is this like a ‘hop bag’ that serves as a strainer? Should I use one for the hops? I haven’t seen these at the brew store, so I wasn’t sure if this was necessary. thanks again. i feel i can get started with your guidance. I really appreciate your help. Yes, the grain bag is what you would store the grains in during the steeping process. You can get them at your homebrew shop. Ask someone, they should have them. If you use hop pellets, you don’t need to strain them. I would suggest you buy hops in a pellet form. I’m using this recipe right now and was just curious how long you suggest waiting after bottling before drinking it? It’ll have fermented for about 2 weeks once we bottle it. I’ll let you know how it turns out once I’m done! I always wait 2 weeks after bottling before opening one up for drinking. You can open one up before that, but I think they are at their best with 2 weeks in the bottle. Just found this recipe on a google search. Looks like it’s been a while since anyone posted. Wondering how this recipe turned out? I’m looking for a solid summer beer recipe to start this week. Thanks! It came out ok. When I brew it again, I will probably focus on one of the special ingredients. I think there was a lot going on in this brew and I would go simpler next time, that is, no ginger. Trying this recipe with dehydrated pineapple in place of the lemon. Should be ready for a 4th of July tasting. John, I agree with your assessment somewhat. My friend and I just made this beer a few months ago and tried it last weekend. Excellent beer, but a little heavy on the ginger. 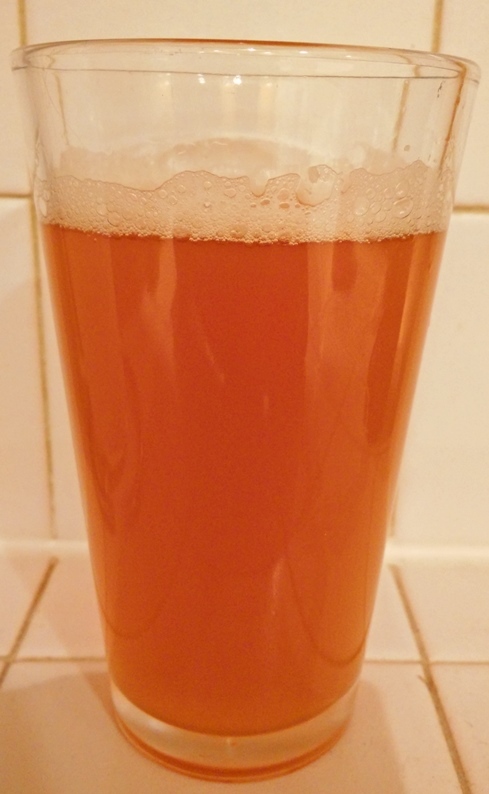 I would consider brewing this beer again, but just use very little ginger, but would still include it. Thanks for your recipe. Overall a great summer ale and easy to make. When do you add sugar-just before bottling or sooner? I am cvonfused by the recipe. Thanks. There’s no sugar listed in this recipe. What do you mean? Do you use sugar at all? To prime the beer for bottling, but not in the recipe. I plan on giving this recipe a try next weekend. How deep did you go on the zest? Were you careful to only take the top yellow or did you go a little deeper? Roughly how many lemons did you use? I kept it to the yellow part. What I do is just take one pass around the lemon with a microplane. That just gets the yellow and none of the pith. I used 4 lemons and they were pretty large. That got me up to 1 ounce of zest. I’d like to give this recipe a shot this weekend but my local brew shop does not carry WLP008 and I can’t find a recommended alternate online. Do you have any suggestions for an alternate yeast or am I better off sucking it up and waiting for a mail order to come through? You can use WLP001. That is a good substitute strain for this recipe. The recipe say to ferment for 2 weeks. Do you go from a primary to a secondary fermentation during that period? Nah, just let it ferment in the primary for two weeks and then keg or bottle. Quick question, I used this recipe with a couple tweaks. But I noticed you said you used sugar to prime with bottles. How much? I used 3/4 cup of corn sugar to prime with. I kind of like a lemony beer since trying Leinenkugel’s new offering this summer. This looks like a good recipe to try. I will convert this to all grain since I have quite a bit of pale 2-row on hand and take your advice on cutting the ginger down to half or even less. Yeah, give it a try. I was real happy with it even with the extra ginger. I’m thinking about adding orange zest and honey instead of the lemon and ginger. When and how much honey should I add to the 60min boil? I would use S-05 from the ones you listed in your comments.